How did an African-American man born in a ghetto in 1879 rise to such religious prominence that his followers addressed letters to him simply "God, Harlem U.S.A."? Using hitherto unknown materials, Jill Watts portrays the life and career of one of the twentieth century's most intriguing religious leaders, Father Divine. Starting as an itinerant preacher, Father Divine built an unprecedented movement that by the 1930s had attracted followers across the nation and around the world. As his ministry grew, so did the controversy surrounding his enormous wealth, flamboyant style, and committed "angels"—black and white, rich and poor alike. Here for the first time a full account of Father Divine's childhood and early years challenges previous contentions that he was born into a sharecropping family in the deep South. 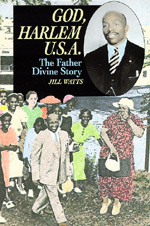 While earlier biographers have concentrated on Father Divine's social and economic programs, Watts focuses on his theology, which gives new meaning to secular activities that often appeared contradictory. Although much has been written about Father Divine, God, Harlem U.S.A. finally provides a balanced and intimate account of his life's work. Jill Watts, Associate Professor of History at California State University, San Marcos, is at work on a book about Mae West.